Imagine strange fibers and other inorganic materials growing out of sores on your skin and feeling like bugs are crawling around under your skin. It’s the type of images that you’d expect from science fiction and horror movies. But it’s a real and frightening disease with an increasing incidence around the world. It sure doesn’t sound pleasant. No one knows how many people suffer from this disease but many of those who have gone public with it have said that they were often given wrong or dismissive diagnoses. Many doctors, thinking the problem is a form of delusional parasitosis whereby people believe they are infected with parasites, often refer those suffering from Morgellons disease to a psychiatrist. It took the research of Mary Leitao, a biologist whose son was suffering from a strange sore on his lip that wouldn’t heal and the feeling of bugs underneath it to investigate the problem further. What she saw, looking through a microscope, was “…were bundles of fibers, balls of fibers…red and blue.’ which glowed under ultraviolet light. But when Leitao took this research to a doctor at a leading hospital, he ignored her discover and advised her pediatrician that the son simply needed vaseline for the lip sore and the mother needed a psychiatric evaluation. Leitao has since established the Morgellons Research Foundation to provide support, advocacy, and information for those suffering from the disease and for those interested in learning more. Today, the Centers for Disease Control and Prevention (CDC) announced they are launching a study to investigate a mystery disease known as Morgellons. 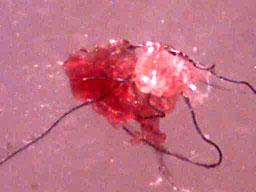 The study, in conjunction with Kaiser Permanente, will take place in northern California where many of the reported cases of Morgellons are located. Study participants will be given blood tests, skin examinations, and psychological evaluations to help determine the cause of this mysterious disease. You can watch ABC “Nightline” at 11:35 p.m. ET tonight and “Good Morning America” Thursday at 7 a.m to learn more about the disease and the CDC study.